Short version: A 500 pound rock fell on me, but I came out OK. Didn't make it to the summit. Last weekend (June 26), my friend Buddy and I headed to the Eastern Sierras to climb Split Mountain. Split stands at 14058 ft on the Sierra Crest, and is reportedly one of the easier California fourteeners. According to Summit Post, the approach from Red Lake via the North Slope is only class 2. There's a ton of elevation gain though - about 7500 ft up from the trailhead to the summit. Getting to the Red Lake trailhead is half the challenge. A nice page at climber.org describes an official route via McMurray Meadows Rd, and a shorter unofficial route through Tinemaha Campground and across private land near a pit mine. When we picked up our permit in Bishop, one ranger told us to take the Tinemaha road, but he was overruled by a second ranger. The leaflet they give you for the Red Lake trailhead specifically asks you not to take the Tinemaha road, so we followed the McMurray Meadows Rd route. Just as we arrived at the trailhead, we met a solo hiker who was leaving in frustration. He said he'd spent three hours bush-wacking, but the trail seemed to give out in the trees somewhere and he finally just gave up. In retrospect, he probably just started at the wrong spot. The trail begins a short distance north of the parking area, at a spring, and then proceeds up a dry hillside with no trees. There's a tempting trail-looking thing from the parking area into the trees right along the creek, but that's the wrong way to go. The Red Lake trail is in pretty bad shape, and I didn't enjoy the hike up to the lake at all. The first several miles were in full sun with zero shade relief, with nothing but scrub brush for scenery, and it reminded me more of typical Los Angeles hillsides than the High Sierras. The trail is partly or completely overgrown in spots. Where it ascends a steep section, instead of having good switchbacks, it mostly just goes straight up a loose sand and gravel slope. I'd read about this ahead of time, but I was unprepared for how it affected me mentally. I wasn't too tired and the altitude didn't seem to bother me, but I was just grumpy and irritated over the poor hiking experience. After a few hours we reached a section with more trees and somewhat better trail conditions, which helped. We reached Red Lake mid-afternoon, after more than five hours of hiking, which seemed impossibly slow for what's supposed to be a 5 mile hike. The lake itself and the surrounding area was very nice, and we had it all to ourselves. The next morning, we began our ascent about 7:15 AM. Just as we started, we bumped into two guys from San Diego who were doing the climb as a day hike, and had started from the trailhead at 3:30 AM. They stopped for a rest at the lake, while we began our slow hike up the boulder field above. It was slow going with lots of rock-hopping, but it wasn't especially steep or difficult. After an hour or so, we reached what we'd initially thought was the ridge bordering the North Slope, but it was just a saddle marking the entrance to a rocky moraine and a steep valley leading to the actual ridge. Snow filled the bottom of the valley. At first we intentionally detoured around it on the rocks above, but we later hiked into the snow and found it was easier there. We didn't have any snow equipment, but the snow was soft and not too steep, so I wasn't worried about slipping and falling there. But as we climbed, the slope grew more and more steep, and we eventually exited the snowfield back onto the rocks. At this point, we were uncertain how to best reach the ridge and the North Slope. The ridge stretched all across our path ahead, but it wasn't obvious which section of the ridge we should climb towards. 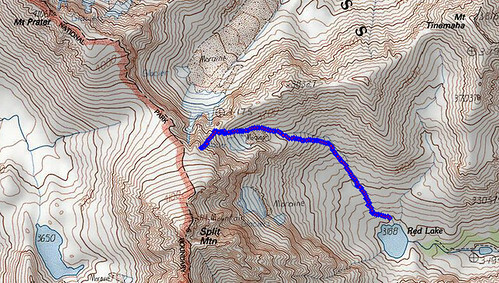 From looking at the map, I believed that anywhere we reached the ridge, we'd pop over it onto the relatively more level and easy North Slope, from which point it would be a straightforward walk to the summit. We saw what looked to be a VERY steep and scary snow-filled chute, leading left up to a point high on the ridge, but assumed that couldn't possibly be the route. It turns out it was, but we didn't realize it. We hiked straight ahead towards a notch at the low point on the ridge. I was still feeling pretty good, and while my friend wasn't moving very fast, he was doing OK too. As we climbed toward the notch, the slope grew ever steeper. Nearing the notch, I got excited and put on a small burst of speed to reach the top. I expected to scramble through the notch and stand on the North Slope with arms raised in victory. But just a few feet from the notch, I suddenly stopped short and saw that it didn't reveal the North Slope, but a yawning drop down a near cliff into some unknown valley thousands of feet below. I froze in place, terrified. I was lost, sitting in a notch on the ridge with vertigo-inducing drops on both sides. Many other people probably wouldn't have thought it was a big deal, but I'm a wimp and I was terrified, and my heart rate went through the roof. I was afraid to even move. When my friend reached me, we took a breath, consulted the map again, and concluded that the correct route must have been the crazy steep snow-filled chute, now off to our left. I was pretty unhappy, and we discussed turning back, but after a while we decided to continue on and see how it went. We traversed across and up some loose rock until we were in the chute, at which point the San Diego guys re-appeared seemingly out of nowhere, just a short distance below us. Now we get to the part of the story with the falling rock. The chute was steep, and I wasn't comfortable hiking up the snow in the center without crampons or an axe, so we skirted the snow on the rocks to the right. It started to get really steep. I stink at estimating angles, but from looking at the topo I'd say it was at least 45 degrees, and I saw one trip report that estimated it was 60 degrees. This was not class 2, but I didn't see any easier route up. It was now hands and feet climbing on loose piles of junk, while my trekking poles dangled useless from their wrist straps. Everything was loose and good footholds were scarce - seemingly everything I stepped on slid out from under my feet. I grabbed ahold of larger boulders where I could, to stabilize myself, and pull myself up to the next rock step. Finally we were no more than 50-100 feet from the ridge. I reached up for a large rock slab just above my head, wrapped my hands around its edge, and tried to pull myself up. In horror, before my eyes I saw the whole chunk of granite pull out of the cliff face above me. Handhold gone, I flipped over backwards and fell as the granite tipped down onto me, and I had just an instant to think "this is going to be really bad." After collecting our wits, we took the hint and began to descend to Red Lake. Thanks to adrenaline and ibuprofen, I was able to hike back down and out under my own power. I don't like to think what the rescue options might have been there if I'd broken the leg. It could have turned out very badly. I'm a little disappointed I didn't reach Split's summit, but given the circumstances there wasn't any alternative. With the horrible road and poor trail to Red Lake, there's no way I'll be attempting Split again from that direction. Maybe someday I'll try Split coming from the John Muir Trail to the west, which is a much longer hike in, but is supposed to be a substantially easier climb. Wow. Certainly one of the more interesting and harrowing trip reports I've ever read. Kudos for surviving the whole deal! Sounds like you had to deal with the same terrible road and loose rock that Carine and I encountered last year . I'm so glad you're okay. The one scant upside to near death experiences is that they make a great story. Sure glad you made it back alive! If that line on the map indicates your location, you were practically done with the hard stuff. It gets easy once you clear the steep area. I climbed Split from the west on a JMT section hike. Got up early, and was back to our camp by noon. Yeah, another five minutes and I think we would have been out of the chute. Rats! But I was so shaken up mentally by the fall, there's no way I was going to continue climbing. I've been thinking a lot about what lessons I should take away from this. I'm not sure how we would have avoided the wrong-turn to that notch. I'd studied the map, and read many other people's trip reports, and they basically all said to just follow the slope up to the ridge. I hadn't realized it would be ambiguous. Maybe I should have stopped to do a compass reading or GPS check to help decide which way to go. Once we were in the chute, were we off route? I'm pretty certain it was the correct chute, although due to the snow we ascended about 15 feet to the right of where Bob did (to the left in his photo as viewed from above), in the section of larger rocks rather than smaller rocks and gravel. Maybe this made it more difficult than it was supposed to be? What gets me is that none of the guide books or trip reports made a big deal out of this section, if they mentioned it at all. I found it to be very difficult. I was scared. Every step seemed precarious and wobbly. I really didn't want to be there. Maybe I should have just turned around, but I convinced myself it was all mental, since the guide books called it an easy class 2 to an easy summit. One lesson I'll remember is to test my handholds in conditions like this. I knew everything was loose and slippery. I should have tested the big rock by tugging on it gently first, before committing and putting all my weight on it to haul myself up. Now you've totally scared me off of Split Mountain. Glad you came out of this okay. But I am wondering now about the approach from the West (via the JMT). Looks like after you drop over Mather Pass (heading south), you work your way to Lake 11598, and then to the saddle between Mt. Prater and Split (the same saddle to which the OP was heading from the East). Stephen Porcella's book, Climbing California's Fourteeners, classifies it as class 2, and the topo seems to support that classification. > classifies it as class 2, and the topo seems to support that classification. Yes, definitely class 2. ...a walk in the park. We camped overnight half way between the JMT and the lake. I got up at dawn and climbed it from the west, was back at our camp by noon. There were lots of nice size trout at the outlet of that lake, by the way. Too bad I was in a hurry. 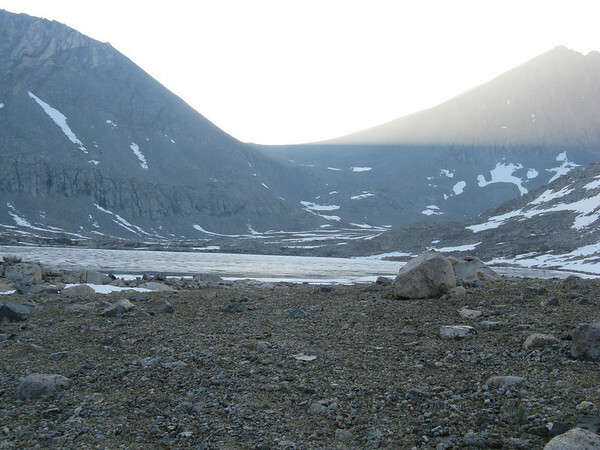 We then continued south, and camped just past Lake Marjorie the next night. Here's a picture of the lake and Split Mtn on the right. Click the pic for more pictures. Thanks, Steve. That is hopeful. Something to consider. Very few trip reports out there on the west approach. You did great getting as far as you did - keep at it and you'll get used to climbing that crap. The view from the top is worth it. The pinstripes will buff out, but many think they add character to a vehicle. You might have been better to stick to the Class 3 next to the loose/steep chute. An even better suggestion is to wait and go back when the chute is filled with snow - much nicer that way. Class 2 in the Sierra is often loose and steep - I think that is where the term Sierra Slog came from. There is no way in heck that I could have completed this hike in a timely manner without Bob's guidance. The fact that you made it up that far without getting lost is impressive. What a great adventure Steve and thanks for sharing with us. Your Split summit will be waiting for you when you return. Yup, that road is pretty brutal. One of my SAR partners and I spent a very cold October night, in an involuntary bivvy, on the saddle in your picture. It was tempting to escape down to the Muir Trail, but the thought of scrambling through the boulder field at night made us decide to gut it out and wait for the helo in the morning. We will never forget that night. The eastern approach by road and trail has really deteriorated over the years. The recent story about missing hiker Gregory Hein gives me chills, because it mirrors my incident so closely. Greg's calf was hit by a falling boulder, just days after my own rockfall accident, in a part of the Sierras not far from where I was hiking. In my case I escaped with only a twisted ankle and knee, but he was badly hurt, with 1.5 inches of bone sticking through his skin and his foot dangling off. He spent six days in the wilderness, eating insects and crawling down a glacier until he was finally spotted by a rescue team. It's scary to be reminded that even when you think you're being careful, there's real danger in the mountain wilderness. No matter how well prepared, anybody can trip and fall on a rock, and in the vast emptiness of the Sierras the consequences can be dire. Two weeks after my accident, I'm still shaken up. So what's the lesson? Don't go? Stay home, avoid all risk, live in a cocoon? I can't accept that. I'm still at more risk on a San Francisco highway than a Sierra trail. But what I can do is reduce the risk, hike with a buddy instead of alone, and make sure somebody else knows where we're going and when we're expected back (which I did, BTW). Generated in 0.251 seconds in which 0.242 seconds were spent on a total of 14 queries. Zlib compression disabled.